Case Presentation: "Jiff" a 9 year old gelding presented with a few day history of drainage from the bottom of the foot and a severe lameness. 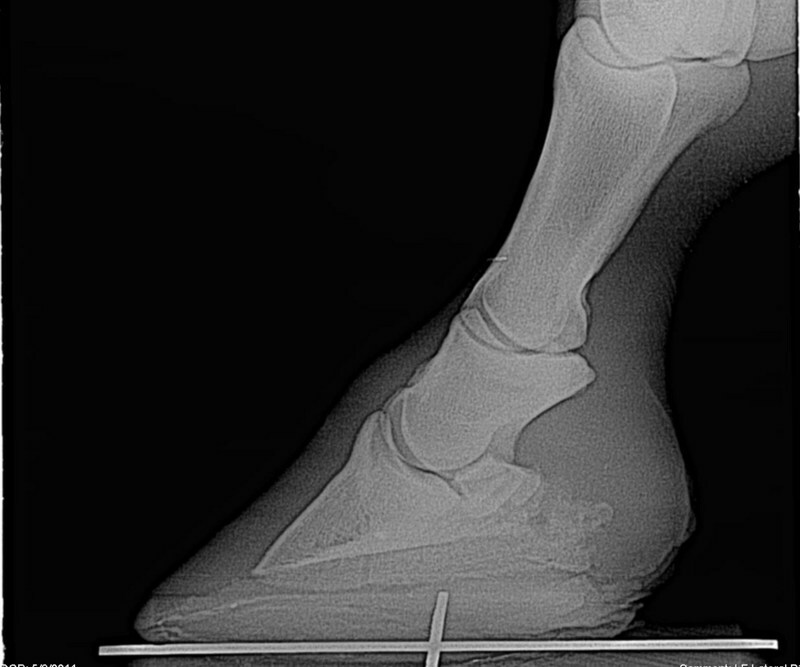 His owner had been treating the foot for a suspected sole abscess for a few days prior to presentation. Physical Examination: On presentation he had a grade 4/5 lameness in the left front limb. There was minimal swelling of the limb. On examination of the bottom of the foot there was what appeared to be granulation tissue near the apex of the frog. The granulation tissue bed was probed and found to be fairly large and undermining the frog. Diagnostics: Due to the severity and duration of the lameness, radiographs were taken to evaluate the bony structures within the hoof capsule. Standard radiographs were taken (Figure 1). There was no apparent bony involvement on plain radiographs. A sterile instrument was used to probe the extent of the granulation tissue (Figure 2). Based on radiographs it was apparent that the wound was more than likely a puncture wound and that it had a tract that extended to the navicular bone. Plan: Based on the size, location, and extent of the wound a "Street Nail" or navicular bursotomy was scheduled. The horse would be placed under general anesthesia and the wound would be debrided and lavaged. While under anesthesia the coffin joint would be aspirated to rule out communication with the wound. 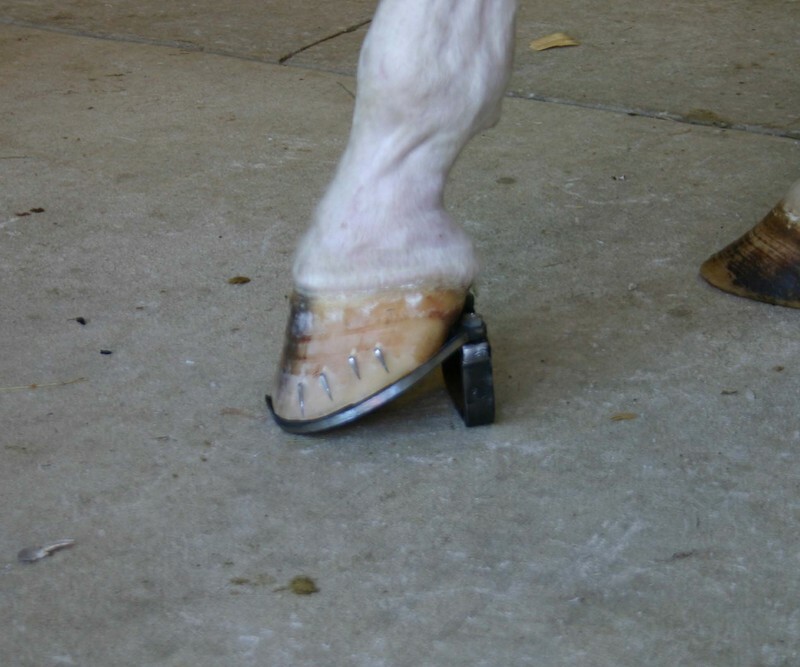 The navicular bone and bursa are close anatomically with the coffin joint, and wounds in this area frequently communicate. Intravenous regional limb perfusion would also be performed. 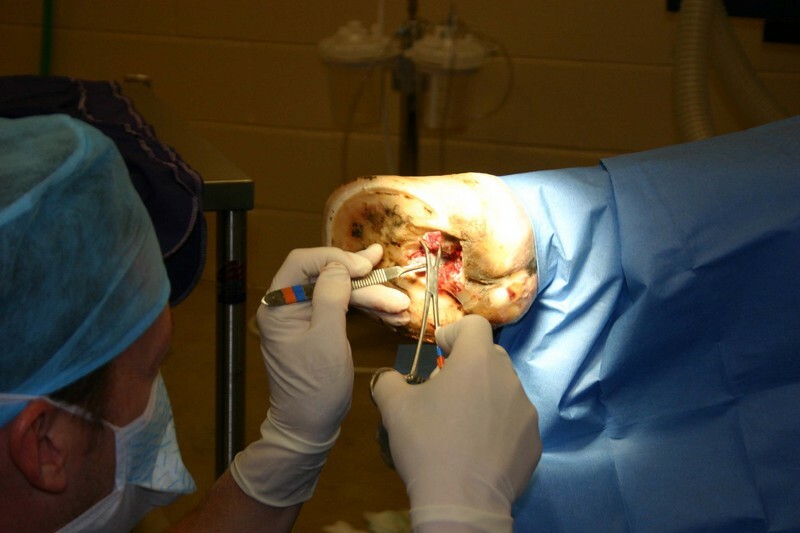 Surgery: The limb was positioned to allow us access to the bottom of the foot. The limb was clipped, prepped and draped. 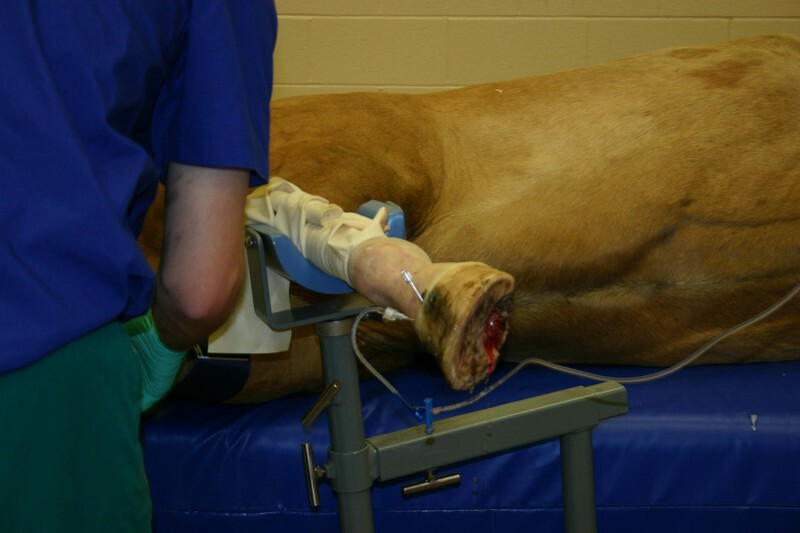 Intravenous regional limb perfusion with antibiotics was administered prior to starting the surgical procedure. Prior to debriding the puncture wound, a sample of synovial fluid from the coffin joint was taken to determine joint involvement. The fluid was found to be abnormal with a white cell count of >80,000. Anything over 20,000 is deemed infected. Due to the high white cell count the joint was pressurized with sterile saline to see if the joint directly communicated with the puncture wound. 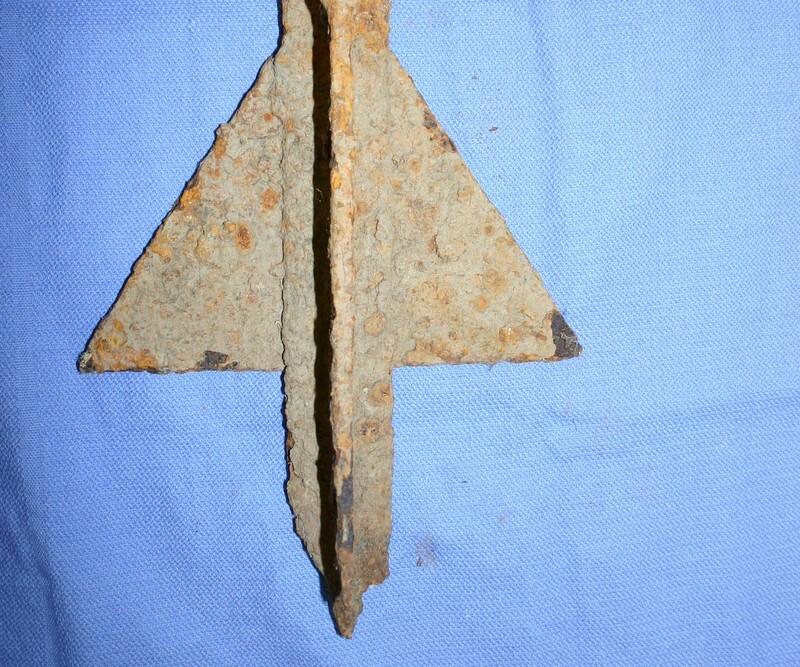 At the time of surgery it did not appear that the coffin joint was readily communicating with the wound. Multiple needles were used to sterilely flush the coffin joint and administer intra-articular antibiotics (Figure 3). The puncture wound was debrided and found to directly communicate with the navicular bone and therefore navicular bursa (Figure 4). The necrotic tissue was all removed down to healthy, normal tissue. After debriding the wound we realized the damaged area resembled a hole that a T-post would make (Figure 5). The wound was packed with sterile gauze and the foot was bandaged. Postoperative: His recovery was uneventful. He almost immediately walked better after surgery. He received daily antibiotics and anti-inflammatories. For the initial 4 days postoperatively, he was walked to the stocks and the bandage was removed. The coffin joint was flushed and intra-articular antibiotics were administered. In addition, intravenous regional perfusion with antibiotics was performed daily. 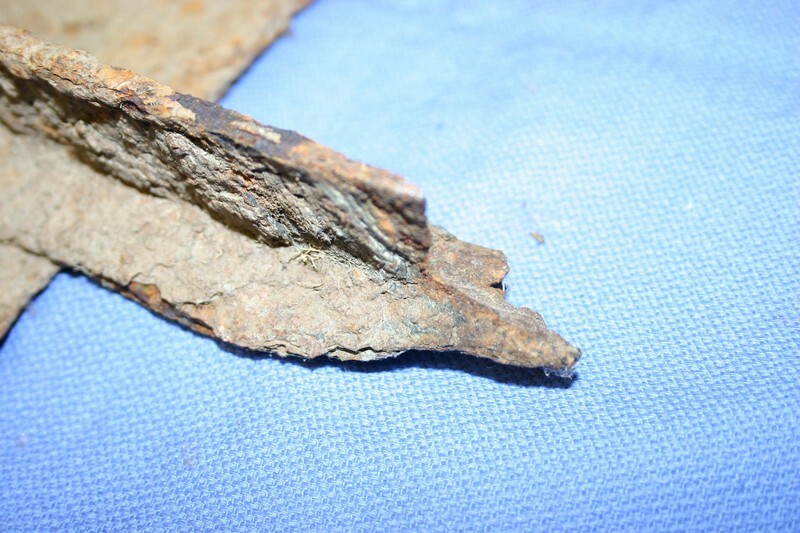 The white cell count within the coffin joint remained normal after this time. The wound was bandaged daily until the drainage became minimal. After having a discussion with the owner that this was most likely a puncture wound that appeared to be in the shape of a T-post, I challenged the owner to find an old fence line where T-posts could have been removed improperly. The owner obtained some historical satellite images of his farm and found an old fence line that was no longer present. When walking the old fence line, the owner came upon multiple broken off T-posts in a waterbed where only a small amount of the post was visible. He actually found the T-post that his horse had stepped on (Figure 6, 7). After a decent granulation bed had formed and the drainage had decreased, he was placed into a patent bar shoe with a full hospital plate (Figure 8, 9). He remained on antibiotics and stall rest at our hospital for the first 45 days after surgery. 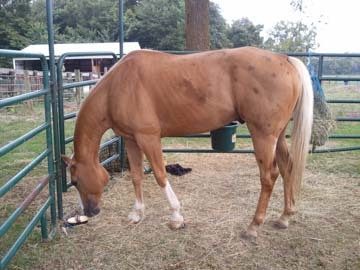 After this time he was discharged to his owners for stall rest. Over the next few months, the patent bar shoe elevation was decreased. His amount of turnout in a small paddock was also increased. At the time of this case report, the owners and the farrier had reported that he was sound at the walk (Figure 10). Discussion: Although puncture wounds of the sole can appear small, they are often deep and can have disastrous consequences. When dealing with puncture wounds to the foot, time is of the essence. There are many important structures within the hoof capsule and they only are protected by millimeters of hoof capsule and sole. Anytime you suspect a puncture wound you should call your veterinarian immediately. 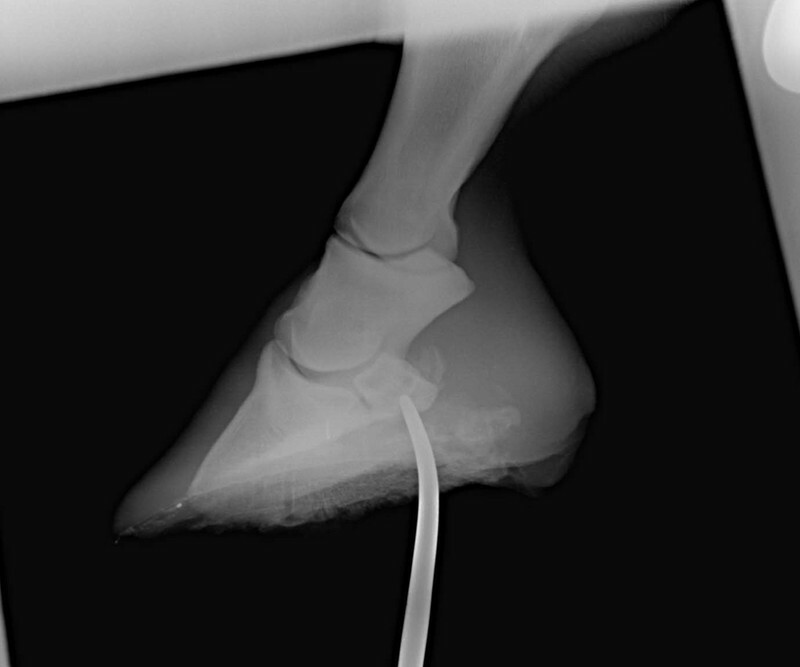 If you find your horse with the penetrating object still in the hoof, you should leave it until your veterinarian arrives to visually and radiographically inspect it. Puncture wounds of the frog and sole are readily missed. The entry site tends to cover up as the object comes out. If the penetrating object remains in place, the horse will usually be lame immediately. 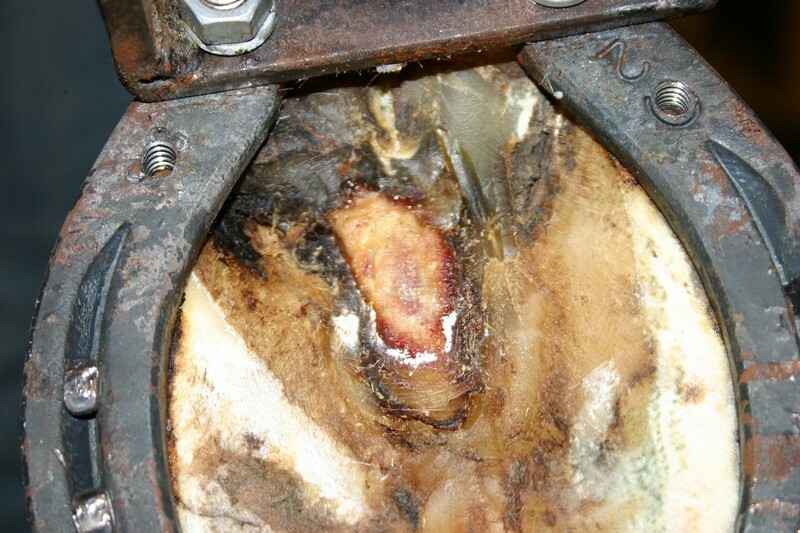 Some horses may remain comfortable if the object comes out until infection sets in. With the object left in place, radiographs can allow you to determine the extent of the penetrating object. If there is no object in place, an instrument, probe, or contrast agent can be passed in the tract to determine the extent of the tract. Depending on the location and depth of the puncture wound various structures can be affected. If you suspect your horse to have a puncture wound, we encourage you to call us immediately at Conley and Koontz Equine Hospital.